As an adjunct to the article in the Black Sheep News, Ilsa our wonderful Kuvasz has been with us for 11 years and is a very integral part of our family. She is a dual purpose dog in as much as she protects the sheep and is a welcoming committee to the guests that arrive at Wooly Acres my Bed and Breakfast business, she along with our border collie Sparky work together to keep predators away. 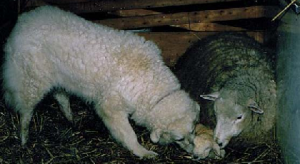 When we were lambing she would help the ewe’s clean up the newborns, and consequently, in her mind they were her babies too. However, after the first day the ewe’s weren’t so amiable and would bunt the pen when she wanted to kiss the babies. On the third day when the babies were allowed out in the main herd Ilsa would wander through the group and give the babies sneak kisses, whenever mom was distracted. 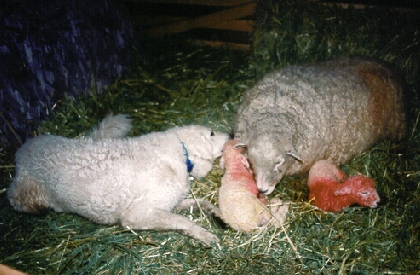 She is a loving dog and protects all things on her property; for instance a guest with a small child that had wandered off, too close to a place where he could have fallen over a low wall into the sheep pen, upon seeing Jim running toward the child, Ilsa ran between the child and the wall and directed the little boy away from the danger. She is also very understanding with older people that are slow walking; when she was a young dog she would walk slowly beside them and let them rest a hand on her for support. She herself is old now and has some stiffness in her leg, so isn’t as spontaneous as she used to be. She knows when someone is upset and will wander over and just sit beside them. Many children from around the world that only see dogs in pictures and are afraid, have been won over by our Ilsa. She truly lives up to her name, of Brantwood’s Bewitching, as she has bewitched many people over the years and introduced her breed to people from all walks of life and many countries around the world. She even surprised a group of visiting sheep farmers from Hungry that only know the breed as aggressive in their home country. They were afraid to get out of their car, but when we told them that she was friendly, and she proved it, they were amazed. Her unconditional love and intuitiveness touches our souls and those of our guests who observe her with awe and amazement. The stories are many and our love for her is more than simple words can describe. We are blessed to share this world with her.